Sunday 4 Some of our officers returned from home. I received some goods from Carrie and Mrs. Walton. Was Brigade officer of the day this evening. Monday 5. 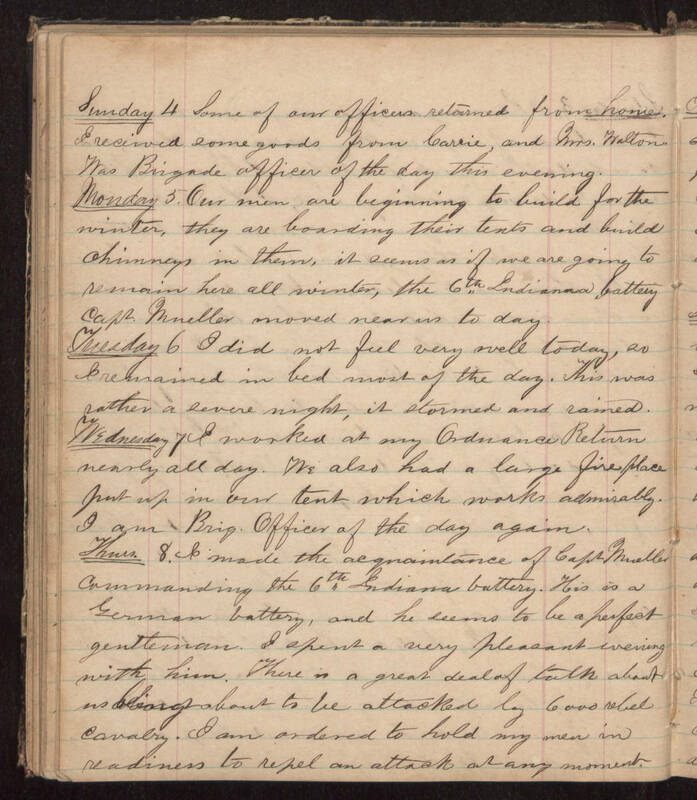 Our men are beginning to build for the winter, they are boarding their tents and bulid chimneys in them, it seems as if we are going to remain here all winter, the 6th Indiana battery Capt. Mueller moved near us to day. Tuesday 6 I did not feel very well today, so I remained in bed most of the day. This was rather a severe night, it stormed and rained. Wednesday 7 I worked at my Ordnance Return nearly all day. We also had a large fire place put up in our tent which works admirably. I am Brig. Officer of the day again. Thurs. 8. I made the acquaintance of Capt Mueller commanding the 6th Indiana battery. His is a German battery, and he seems to be a perfect gentleman. I spent a very pleasant evening with him. There is a great deal of talk about us being about to be attacked by 6000 rebel cavalry. I am ordered to hold my men in readiness to repel an attack at any moment.